A spring garden any time of the year! 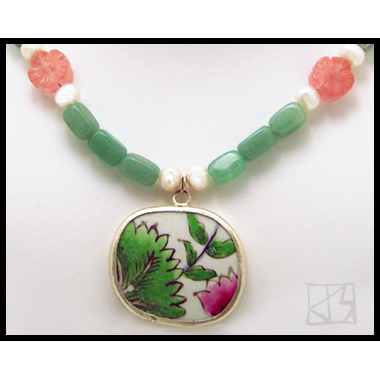 Called "Ming shards", these popular pendants are not antiques at all. (They were back in the early 1990s, but those can no longer be found... the market is saturated with newer pottery shattered just for this purpose, or even painted by the thousands in contemporary Chinese factories.) The only thing to look for then as a collector of shard jewelry is sterling vs. silver-color base metals. 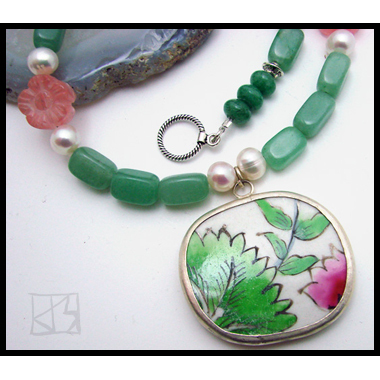 This pretty floral in pink and green is balanced on a strand of genuine jade blocks, which are punctuated with large freshwater pearls and gorgeous hand-carved sakura (plum or cherry blossoms) in rose quartz. The necklace closes with a Bali sterling clasp. I handpick my strands and then carefully choose each bead from among them for every piece I create... color matching, flow of patterns is essential to my designs. I love to play with compositional dichotomies � in this case the blocky geometry of the green jade against the organic shape of the flowers.